Electric double layer capacitors or called super-ultra-capaciptors are recent developing electronic devices in the late seventies of the twentieth century. They are different than the traditional capacitors which the medium was placed between two electronic sheets. The piniciple is utilizing ion electric double charge stored of both interfaces to produce large Farad grade capacitance. The figure is as follows. More recently EDLCs have been developed. They are widely used with micro computers, IC memories, autorcar, aviation or spaceflight as well as home electronic etc. But to elect suited electrode materials is whether the technology of EDLCs can be gotten wider application. 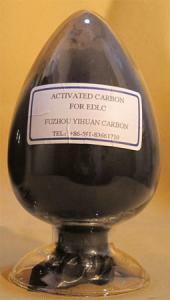 Therefore activated carbon for EDLCs YEC-X series developed by our company not only have excellent electrochemistry performance but also remain high surface and high capacitance. And our produts have been practically operated by many internal or international manufactures or research onstitutions and won praise.